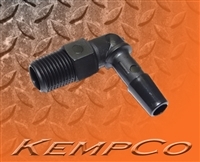 Threaded Hose-barb Adapter Elbow Fittings for adapting NPT to Hose or tubing. Available in many different sizes and materials, for a variety of applications. If you don't see the part you are looking for, just Contact Us. Many fittings may be available in alternate sizes and materials.